Following the events of April 16, 2007, there was an immediate outpouring of support from communities around the world. It was a time before Twitter and Facebook became dominant forms of community engagement. The form of condolence was more physical: Over 90,000 condolence items were received in the form of banners, cards, posters, music, craft items, and more. These items were sent to Virginia Tech or left by visitors to campus in an effort to provide support and solace to the Virginia Tech community. To preserve this outpouring of support, the University Archives, under the direction of University Archivist, Tamara Kenelly, collected items into the Virginia Tech April 16, 2007 Archives of the University Libraries. This collection includes over 500 cubic feet of material consisting of thousands of examples of the world becoming one global community to support Virginia Tech. Eighty countries and all fifty states are represented in the collection. During the summer of 2007, an effort was made to capture and put online items representative of the whole collection. 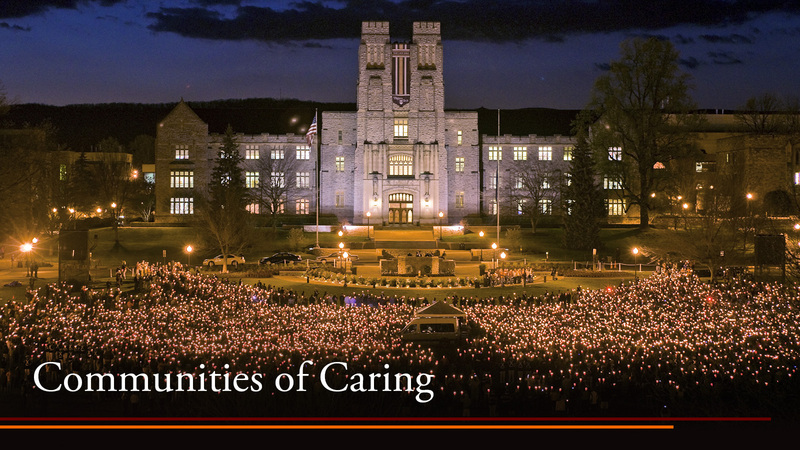 Over that summer, a couple thousand images were taken and placed into a digital collection, the "Virginia Tech April 16, 2007, Condolence Archives of the University Libraries". This exhibit, Communities of Caring, takes items from the digital collection and highlights the types of communities that reached out to Virginia Tech in this global show of support. April 16, 2017 will mark the 10th anniversary of the events that sparked the flood of support from communities worldwide. Since many from those communities will be unable to come to Blacksburg to honor the anniversary, this exhibit is provided as a way for them to reconnect with the sense of universal community represented by the items they sent.